Sellier & Bellot may still be somewhat unknown in the USA by some shooters but they shouldn’t be. The precision and reliability of this brand on a whole has been fantastic, especially for military cartridges like 9mm Luger. It’s rare that there are issues with a batch of Sellier & Bellot and as such they have gained a very loyal following in those that have used them. 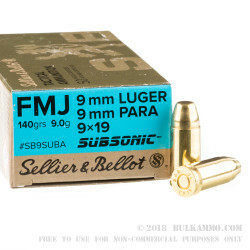 This 9mm Luger load is a subsonic round perfect for range duties when playing with the suppressor, or for those that simply prefer to shoot subsonic ammunition for sound reduction or other purposes. This 140 grain projectile is a FMJ design that offers a significant and welcoming difference in recoil. The felt recoil is a noticeable difference with a push rather than a flip or snap like you might find in a similarly loaded supersonic 115 grain or even a larger grain weight. The 1000 feet per second velocity and the 310 ft. lbs. of energy are substantial enough to help reliably cycle most firearms with a suppressor, and yet they are less demanding ballistic numbers which makes for a more enjoyable shooting experience. 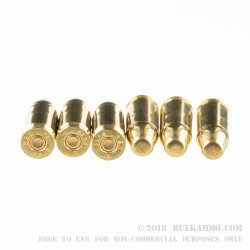 Some nice features of this ammunition include the brass case and brass coated bullet as well as the lacquer sealed primer, which makes these cartridges excellent in storage. Q: I am wondering what "subsonic" means in reference to this round. Thanks very much. A: Subsonic ammunition will launch the bullet/projectile out of the muzzle below the speed of sound. This will prevent the bullet from making the supersonic crack heard when an object passes through the sound barrier. 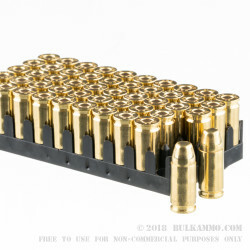 Thus, they will be slightly quieter than normal 9mm ammo, although they will still be very loud and not safe to shoot without hearing protection. 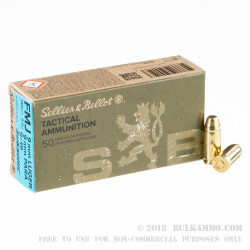 Subsonic ammunition is most useful to those shooting with sound suppressors (commonly known as silencers), for when used in conjunction with those devices, subsonic ammunition is very quiet.